In this section we have recorded and photographed as many of the graves we could find that are either C.W.G.C. graves or are private graves with either the service person buried within them or have their names inscribed on the headstone. The memorial below is for men who's graves could no longer be maintained by the commonwealth war graves commission due we think t the access and the state of Brookfield Unitarian church on Hyde road, Gorton. The men are still buried in Brookfield but now have a memorial here in Gorton cemetery. ALBERT ERNEST JAMES SERVED WORLD WAR ONE. Many men & women who died during or shortly after both world wars may not be on this website but maybe buried in this cemetery. Many died shortly after from their wounds or the effects caused by them and would be out side the qualifying dates to be listed as war deaths. These brave people may not have a headstone or could be buried in public graves with no markers? 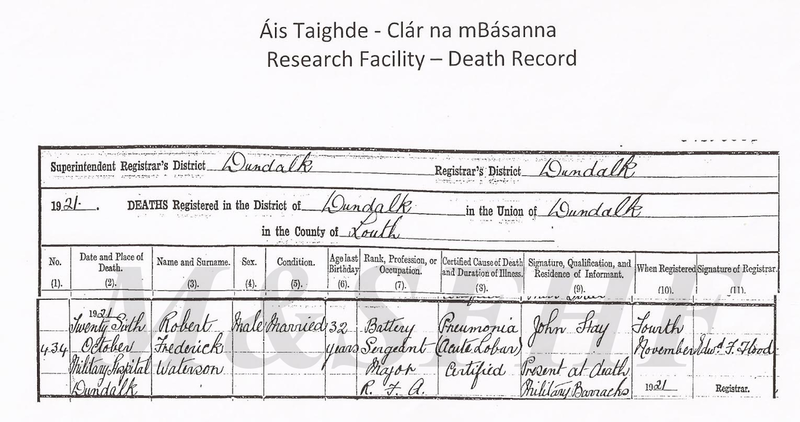 We are trying to locate both their grave location and any records relating to them. One such family is the Waterson's. They had three sons's who served world war one. Two died, one during world war one and the other just after but still in active service. Gazette for his award of the Military Medal on 10th Nov 1916. Robert was also awarded the Distinguished Conduct Medal and the report in the London Gazette on 2nd Dec 1919.
" On the morning of 27th Sept, 1919, near Moevres and during the following few days, he displayed marked gallantry. When his battery was firing the barrage it came under very heavy shell fire, one gun receiving a direct hit which killed three of the detachment, and the camouflager and ammunition of two other guns being set on fire. He controlled his detachment and kept his gun firing the whole barrage. All through the attack he showed courage and resourcefulness of an extremely high order, and set a splendid example to the remainder of the battery."